When compared within the Asian region, Sri Lanka has creditable achievements in aspects of education such as school enrolment, literacy and gender equity. However, the country faced with increasing levels of poverty due to the rising cost of living has a war to wage. The war against child labour. As Dr. Hiranthi Wijemanne, former Chairperson of the Child Protection Authority pointed out at a recent seminar on eliminating child labour organised by the Panos Institute in Colombo to coincide with the Day Against Child Labour, at least 70 per cent of children in Sri Lanka carry out domestic work and other economic activities. Ninety five percent of these children were pointed out by Dr. Wijemanne to be hailing from rural areas. And in this backdrop as we observe this year's World Day Against Child Labour attention would be on raising awareness that education is the right response to child labour. In Sri Lanka, the commemoration of this day comes amidst heavy lobbying by educators to change the compulsory schooling age from 14 to 16 years. This change is among the 10 proposals handed over to the Minister of Education, Susil Premajayantha by the All Ceylon Union of teachers and Education International affiliates in Sri Lanka last month. Therefore a key focus in Sri Lanka this year is on the role of teachers in combating child labour. As Angela Wijesinghe, General Secretary of the All Ceylon Union of Teachers points out, with increasing poverty, child labour in Sri Lanka is fast becoming a survival option for many rural families. Therefore a comprehensive Government policy is stressed to combat circumstances that force children to drop out of school. "Sri Lanka does not have a national education policy. We only have certain principles laid down with regard to a child's right to education. This is not sufficient to ensure that all the children of this country, irrespective of race, religion, area of residence or any other difference, are ensured of quality education," notes Wijesinghe. She further points out that the need of the moment is a social safety net for poor families, more scholarships for needy children and opportunities of work with adequate pay for adults. Poverty, the addiction of parents to alcohol and drugs as well as the migration of mothers to the middle-east for employment that result in the neglect of children, are some of the most common reasons for child labour in Sri Lanka. In the North and East of the country the ethnic conflict, the threat by terrorism and the recruitment of child soldiers are key reasons that induce poverty and force children to work in the most dangerous of circumstances. While much of the present recruitment of children is for shops and markets, the education authorities concerned should also take note of the large numbers of street children who do not have any access at all to education. These children could be easy prey to sexual exploitation that could forever end their chances of education. Clearly, it should be reiterated that if we are to wipe out child labour what is compulsory is to provide a system of education that would equip students, irrespective of their social strata with the necessary knowledge, skills and attitudes, to empower them and make them employable and productive citizens. The National Education Commission (NEC) appointed in 1991, after studying the memoranda received from professional associations, trade unions, university community, teachers, political parties and the public submitted their recommendations in 1997. A programme for the implementation of the reforms began in 1999 and as we head towards the future, the importance of the need for continuing our interest in providing an innovative and consistent education structure suited to all our children has to be stressed. The elimination of child labour is one of the four fundamental principles of the ILO Declaration on Fundamental Principles and Rights at Work and is a key element of the ILO's Decent Work Agenda. The ILO's Policy on Child Labour is Contained in the child labour conventions: the Minimum Age Convention (No. 138) of 1973 and the Worst Forms of Child Labour Convention (No. 182) of 1999, both ratified by Sri Lanka. Of all the world's children, approximately one in seven is involved in some form of child labour. However, action by the international community over the past decade has shown results in tackling child labour. Expansion of access to basic education. Many countries that have removed school fees have seen dramatic increases in school enrolments. Implementation of social transfer programmes which have involved governments making a cash transfer to poor families on condition that children attend school. Such programmes have had a significant impact on child labour in Latin America and elsewhere. Increased action on the part of governments, with ILO Conventions on child labour now being widely ratified. 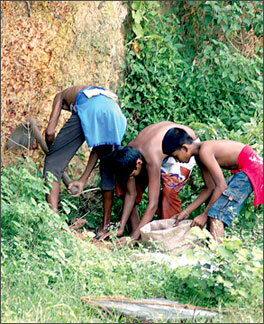 Despite this progress, child labour remains a significant problem in many countries. Thus there remains an urgent need to tackle the problem in a holistic manner, combining education with poverty reduction strategies. The ILO is pursuing a Global Action Plan to tackle child labour. It starts from the premise that effective elimination of child labour can only be achieved at the country level and that member States must be at the forefront of such efforts. The plan calls for the adoption of time-bound targets to meet the goal of eliminating the worst forms of child labour by 2016 and identifies various means by which the ILO can support this process. This target parallels and contributes to both the Millennium Development Goals on education and poverty and to the effective abolition of all forms of child labour, a fundamental goal of the ILO. Needless to say, the ambitious target of 2016 for the elimination of the worst forms of child labour set in the Global Action Plan is just around the corner, and a concerted effort needs to be taken by stakeholders to achieve it. Fundamentally, this requires the political will of Governments to stay focused in their efforts to end child labour.